Travelling on to St. Thomas leads you to a local landmark: Shaw’s Ice Cream, where ice cream has been produced since 1948. Today, three sisters carry on the tradition, making over 50 flavours of ice cream with fresh, local cream and the purest flavourings. The town’s Railway City Brewing Company offers tastings, tours and a lesson in local history (the craft brewer’s Dead Elephant Ale is a tribute to the beloved circus elephant, Jumbo, who was killed in a railway accident in 1885). Don’t leave the area without a tasting at Quai Du Vin Estate Winery -- music lovers will want to time their trip with one of their fun outdoor summer concerts. Next, make for another Great Lake, journeying back in time to the main street of Erieau on Lake Erie. Here, one of the region’s most beloved craft breweries, Bayside Brewing Co., is housed in the former Tilt ‘N’ Hilt ‘N’ Hotel and includes brewing facilities, a tasting room, retail area and a brew pub offering delicious wood oven pizzas. Finally, wrap things up with a trip to Apple Land Station in Thorndale, home to a whole crop of farm-themed activities including pick-your-own apples and pumpkins, a farm train, a corn maze, and adorable barnyard animals. The onsite bakery offers freshly baked apple pies that are truly epic -- each one is piled high with 3.5 pounds of apples! 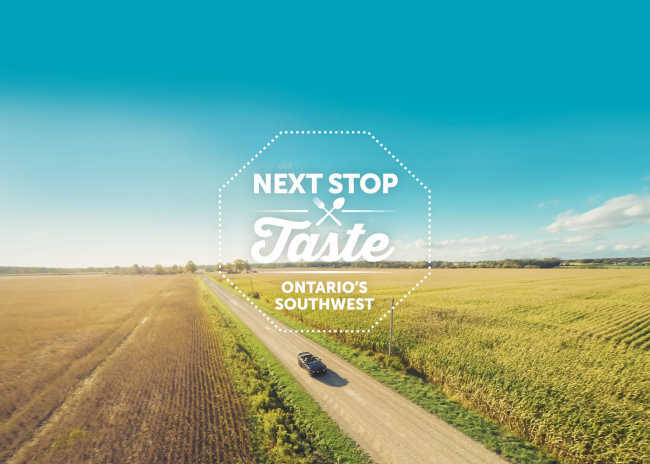 If you’re up for more tasty adventures, check out the entire Next Stop Taste video series to guide you on your travels discovering the best wine, beer, cider, crops and cuisine in Ontario’s Southwest. Make sure to check back often as new episodes are added.